Walking back to the car after lunch at Ella’s, a Co Co Sala sign beckoned me and Mr. X-sXe: “Frozen Co Co.” It was 90+ degrees, and humid as a devil’s armpit. We dutifully went inside. CoCo Sala opened a chocolate boutique adjacent to their main restaurant about a year ago. As we waited for our drink to be blended, we checked out the high-end goodies. 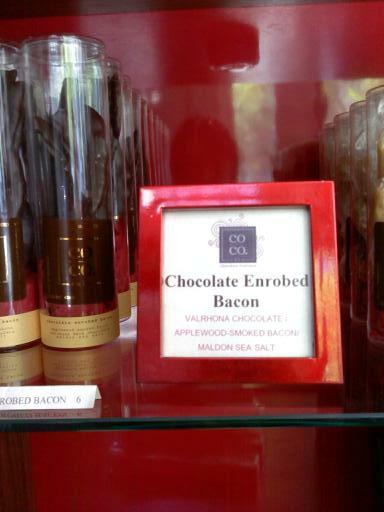 “Chocolate-enrobed bacon,” read one sign. It brought back memories of the mac and cheese I’d had here a couple years ago, which came with a piece of said bacon. Although a little too chewy, it actually went well with the mac. Finally, the frozen “co co” emerged. It’s made with ganache (chocolate + cream), ice, and chocolate shavings. Liquefied brownie meets Frappuccino. Delicious, yes. But if you’re looking for something light and refreshing on a hot summer day, this isn’t it. While inside, Mr. X-sXe was taken by the fetching display of individual chocolates. Next thing you know, we walk out with a box of 4 for $10. At that price, it almost hurts to eat them. Our flavors were pistachio, lemon, co cojito, and banana ginger. While they were all good, I can only get so excited about filled chocolates. Doesn’t matter how high end they are—they always bring back memories of the Whitman’s samplers we’d get at the drugstore as kids (“I want the chocolate-covered cherry!”). Damn you for ruining filled chocolates for me, Whitman’s. Pork belly donuts. Do you dare? Dear U Street Music Hall: Your pork belly donuts take the pig-product-as-dessert trend too far. Yes, I’m a fan of chocolate-covered bacon, bacon Rice Krispy treats, and even bacon-fat cookies. So why must I draw the line? Because pork belly is 90%+ chewy (ok, delicious) fat. 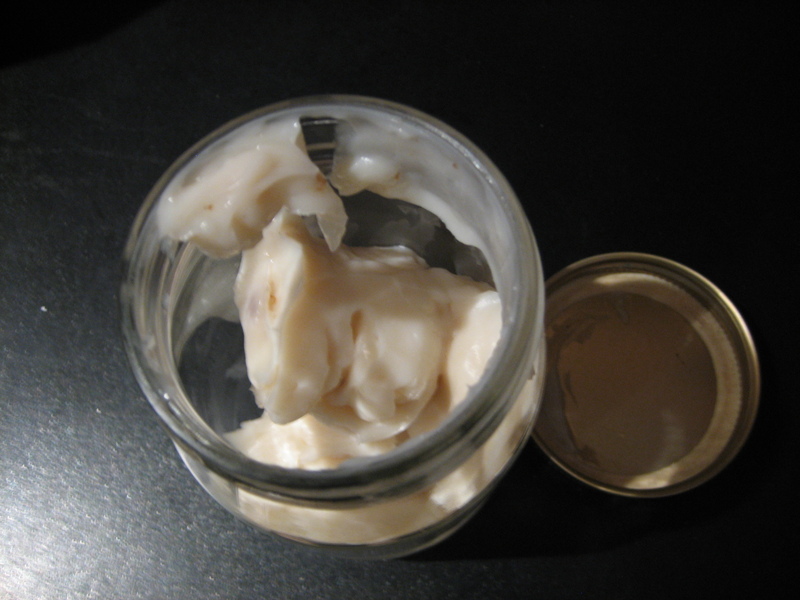 But putting pig products like bacon, for example, in desserts works best when the fat has been rendered off so you’re only left with the crispy meat. That’s why I don’t enjoy Vosges’ bacon bar—it’s like eating chocolate-bacon gum. Why would anyone want to wrap their lips around a donut sandwich with a sizeable chunk of fat in it, unless they were training for the 2012 Olympics? Mushy donut + chewy pork belly fat = mouthful of greasy yeastiness. Fluffy donut + luscious pork belly slice = salty-sweet heaven. But I’m probably not brave enough to find out. There’s something cool about getting really great food from a truck. Like, how do they cram so much tastiness into such a teeny space? How high-tech is the setup back there? And will I be able to track it down today? It’s all part of the mystique of the food truck. Well, the Bobby Flay bread pudding throwdown has had me foaming at the mouth to try the Dessert Truck’s winning chocolate bread pudding. It was one of the food stops on my ever-growing list of places to try in NY. So on a recent business trip to NYC, I swung by to pick up something to bring home. The bread pudding, which is less bread than pudding, comes with a bacon custard that’s just smoky enough. It wasn’t a gratuitous use of bacon in desserts, which was a relief. The pudding reminds me of the filling in dark chocolate lava cakes–pure liquid richness. This isn’t a dessert for people who don’t like dark chocolate. Most bread puddings are too bread-y for me, but this one has barely enough bread chunks to give the dessert some texture. It’s really the perfect balance of bitter and sweet, bready and creamy. These survived a 4+ hour trip from NYC to DC. Presentation suffered, but taste didn't. Given how much I spent on a cab to/from the truck, I decided to try the creme brulee as well. This was creme brulee properly done, with tons of vanilla bean flecks bringing the flavor. Not as unique a taste combination as the bread pudding, but delicious nonetheless. Was it worth the cab rides (that cost more than my desserts totaled), and the stress of wondering I’d make it back to Penn Station in time to catch the train? Definitely, yes. Get the recipe for Dessert Truck’s bread pudding. Bayou Bakery is a welcome addition to Arlington, sitting in the old spot where Camille’s used to be on North Courthouse Road. I went in for the sketchily named Muff-a-Lotta sandwich (one of my new favorite sandwiches, perhaps even trumping Taylor Gourmet’s 9th Street Italian) but as I went to pay, their dessert case beckoned. 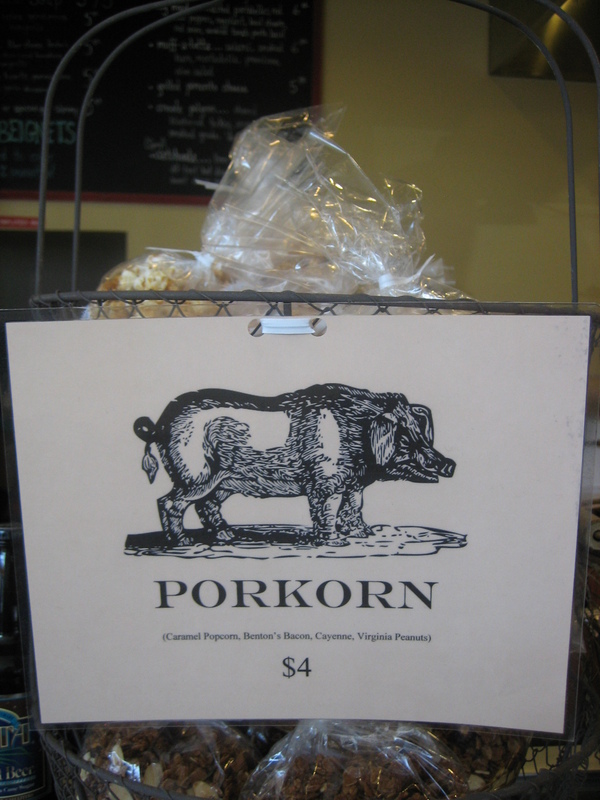 I ended up taking home a bag of the PorKorn, since cupcakes and whoopie pies seem ubiquitous these days. 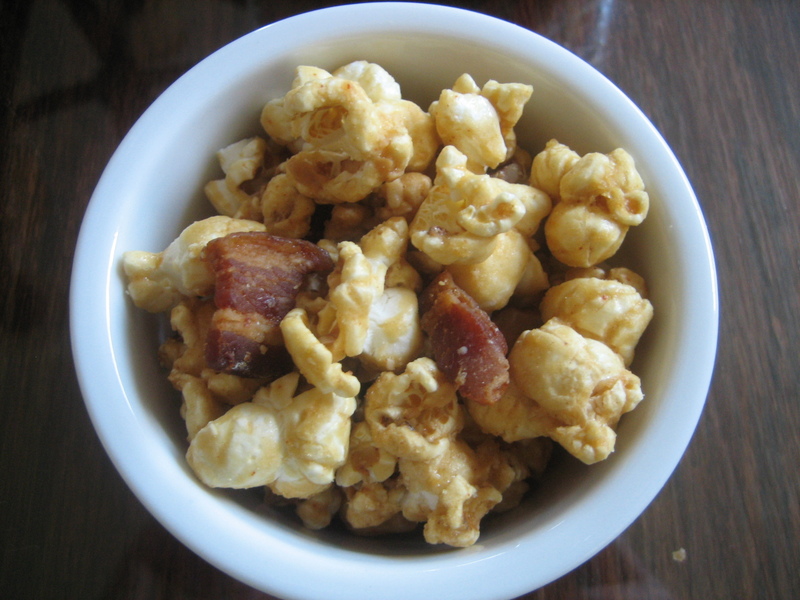 There are few desserts that haven’t been touched by bacon in the past few years, including this take on caramel popcorn with pork drippings. It had a smoky, spicy kick, although the bacon bits were so hard, I was afraid I’d crack a tooth. Every other table around me seemed to have a plate of beignets on them. Here they’re made to order, and you can get ’em full-on Cafe du Monde style with a mug of chicory coffee. Although I’m ambivalent about fried-dough desserts, they’re on my list for next time. Tom Sietsema of The Washington Post may have been unimpressed by some of the savories here, but he pretty much dug all of the sweets he tried. Despite his lukewarm review, this place is definitely worth crossing over to NoVa (closest Metro: Court House). Unless boogers taste like vanilla ice cream with a caramel ribbon. 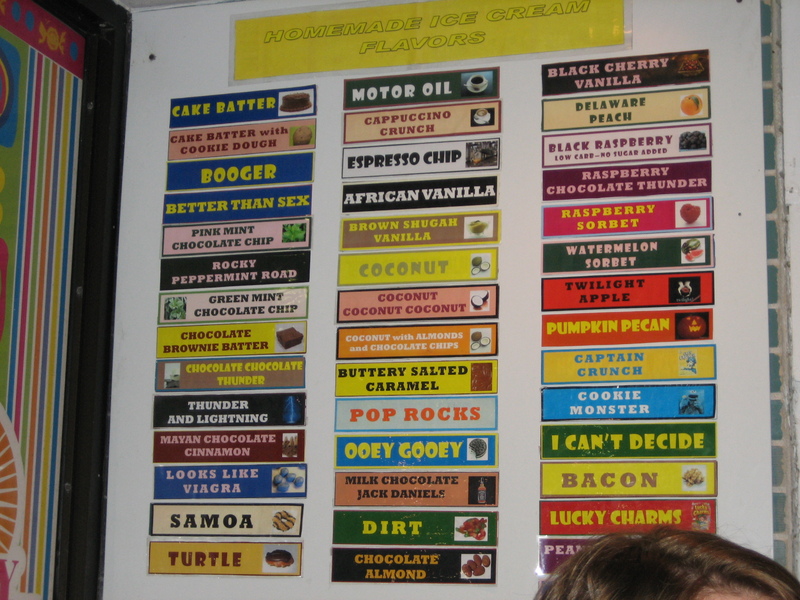 This is but one of the out-there flavors currently on the menu at the Ice Cream Store in Rehoboth, DE. 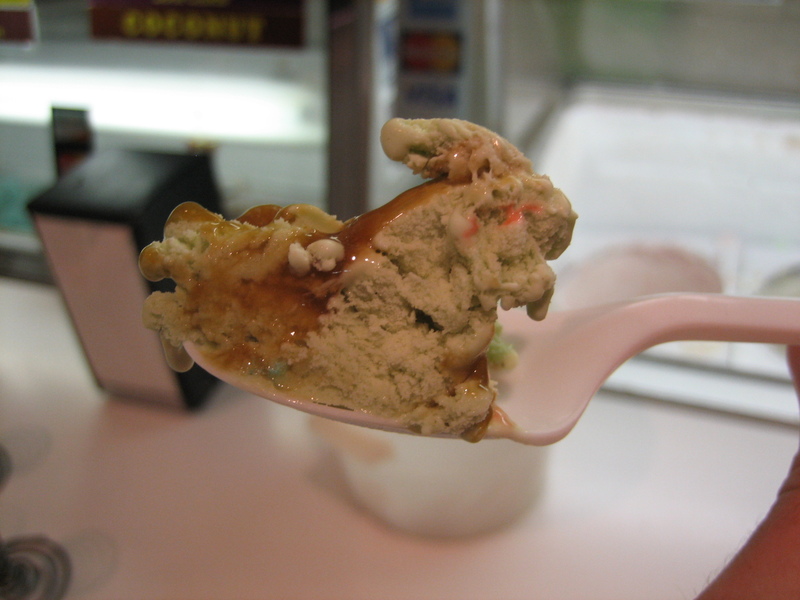 The Ice Cream Store is known for offering at least a couple unusual flavors that rotate throughout the year. Luckily, no matter how unpalatable the flavor sounds, they still make it taste good. PS: If you don’t know what “fluffy pork” is, ask a Chinese friend or just Google it. Party in your mouth? A cross-section of the chicharron chocolate bar with pork rinds. Does hearing the words “chocolate-covered bacon” make you yawn? Then maybe it’s time to try the chicharron chocolate bar made with pork rinds from Xocolatl de David, if you can get a hold of one. These are hard to come by because they were made in limited quantities. (Food Network magazine describes the flavor as Nestle Crunch with a bacony twist.) But the Xocolatl de David online store did have a Raleigh Bar with bacon caramel on top of pecan chocolate nougat that you can order.